The 1923 Hotel Retlaw, built by Milwaukee&apos;s Walter Schroeder and designed by a Cream City architect, is getting a luxury makeover. Published Oct. 11, 2018 at 9:02 a.m. Though it's nowhere near as big as the Hilton Milwaukee City Center, The Hotel Retlaw towers over Fond du Lac's downtown just like the Hilton has long commanded respect on its own skyline, reminding us that Brew City hotelier Walter Schroeder left his mark on more than just his hometown. The Retlaw, 1 N. Main St., which opened in 1923 and has suffered a long, slow decline and slapdash changes that have tarnished its dignity across the years, is currently undergoing a massive makeover; one that will make it the first luxury hotel in its area. 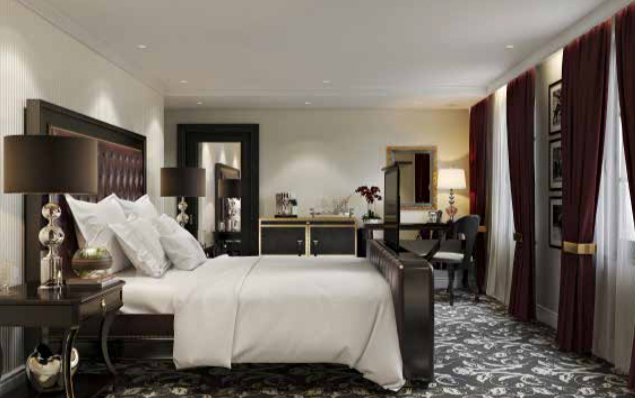 Due to open on phases this winter – the first three floors are slated to go online in December, with guest rooms becoming available beginning in January – the hotel's glory and status will be restored, along with as much of its original detail as is possible when it reopens as a locally owned, independent luxury hotel. Born in Milwaukee in 1878, the son of German immigrants who ran a butcher shop in the Third Ward, Walter Schroeder (pictured below right in an image courtesy of Milwaukee School of Engineering) landed a clerk job in the Register of Deeds office, where, in addition to earning $3.50 a week, he learned the ins and outs of real estate, a business his father had already begun dabbling in with his other sons. Almost simultaneously, and still fresh out of eighth grade, the 14-year-old Schroeder also began earning another $6 a week as a staffer at the Milwaukee Daily Reporter. In just two years, Schroeder walked into the boss' office and offered to buy the paper. He walked out without a deal and without a job. So, he started his own newspaper, The Milwaukee Daily Abstractor, attended business school at night and then later bought the Reporter and merged the papers. When he was 21, he joined his father in the real estate and insurance game, soon inheriting the business. Three years later he was already listed in the book, "Notable Men of Wisconsin." In 1912, Chris. 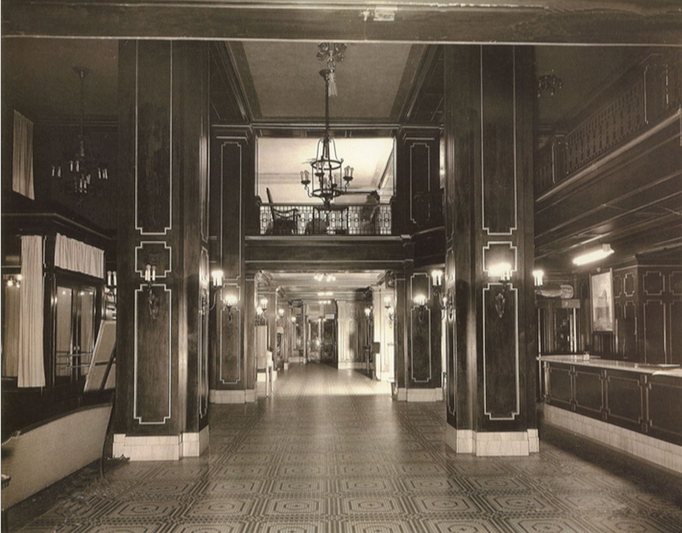 Schroeder & Son provided funds for the refinancing of an $800,000 bond issue for the then new Hotel Wisconsin, the largest hotel in Wisconsin at the time, and thus did Schroeder become a hotelier. 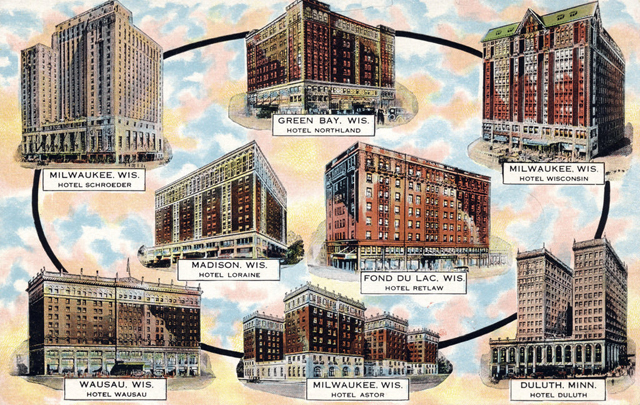 Recognizing the lack of good management, Schroeder took over running the Wisconsin himself in 1914, which then led him into a new field: the development of a chain of hotels. Starting with the Hotel Astor on Milwaukee's lower East Side in 1918, Schroeder added the Retlaw in Fond du Lac in 1923, the Hotel Loraine in Madison in 1924 and the Hotel Northland in Green Bay, all designed by the Milwaukee firm of Herbert W. Tullgren & Son (the son being Martin, whose work is also well-known here). 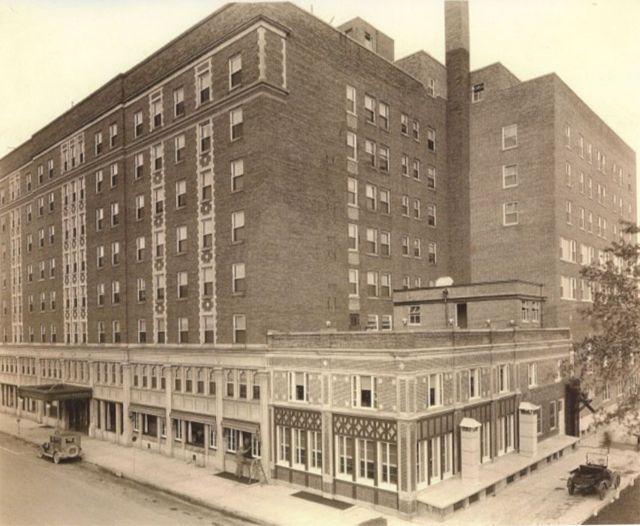 In 1925, he added the Hotel Wausau, in Wausau, and the Hotel Duluth in Minnesota, and two years later, the eponymous Schroeder Hotel (now the Hilton City Center) in Milwaukee. 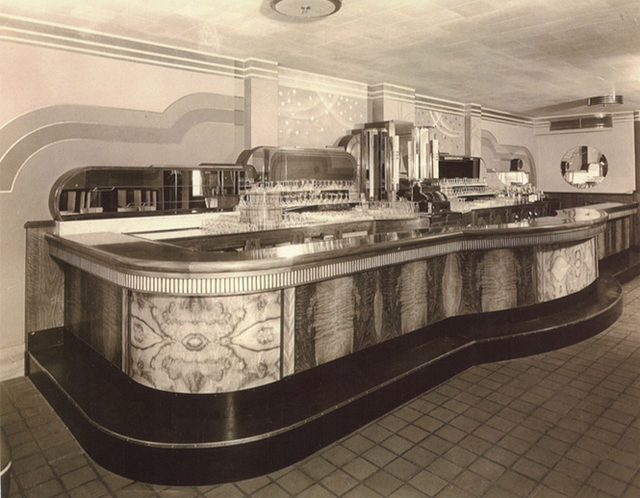 The Wausau and Schroeder were designed by the Chicago firm of Holabird & Roche; Tullgren did Duluth. Schroeder also purchased, rather than built, some properties, including the Calumet Hotel in Fond du Lac and the Vincent Hotel across the lake in Benton Harbor, Michigan. 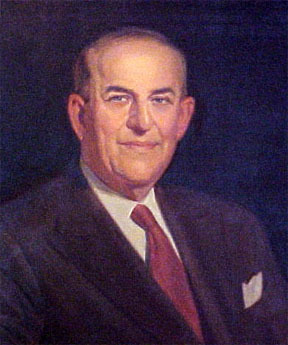 In addition to becoming something of a local celebrity and a much in demand fellow, the ultra-rich Schroeder also gave his money away and, as a result, his name is on a dorm at Marquette University, a library at Milwaukee School of Engineering, a space in the Humphrey Scottish Rite Masonic Center and a YMCA aquatics center. Though he died in 1967, some say that his spirit lives on, quite literally, in some of his buildings, including the Retlaw, though he did not deign to greet me on my recent visit. You can hear a fun take on Schroeder's many alleged hauntings on this episode of "This American Life." For his first hotel in Fond du Lac, Schroeder tapped the Tullgrens to create an eight-story Neoclassical tower in red brick. "The Hotel Retlaw is a largely intact example of a 1920s era Neoclassical revival styled large hotel," notes the Wisconsin Historical Society's Architectural Inventory. "The exterior facade has not been visibly altered since its construction in 1922." However, a small addition, which still stands at the back, was erected in 1923. Another, closing off a gap created by the earlier addition, was built four years later. "Built by Immel Construction Co. ... the brick and stone hotel features symmetrical facades with regular patterned window fenestration. The first two floors exhibit a light colored stone facade regularly appointed by rectangular pilasters. The pilasters support a similarly treated entablature with simple architrave, frieze and corbelled cornice, located at the top of the second floor. "Another horizontal band of stone coursing with a projecting cornice runs across the facade at the top of the seventh floor level. 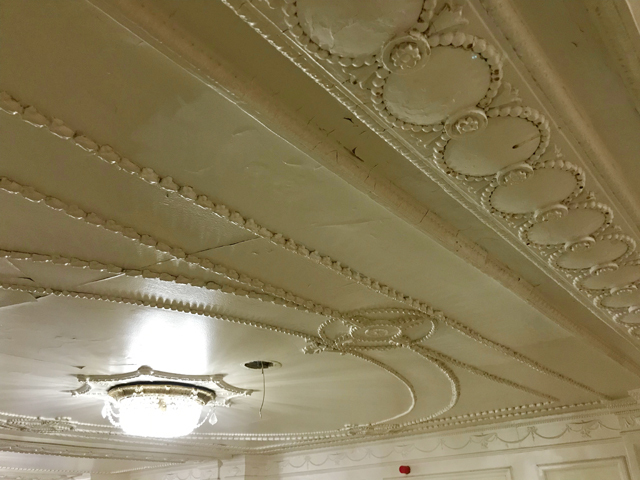 A similar but more pronounced cornice is located at the top of the eight floor level. 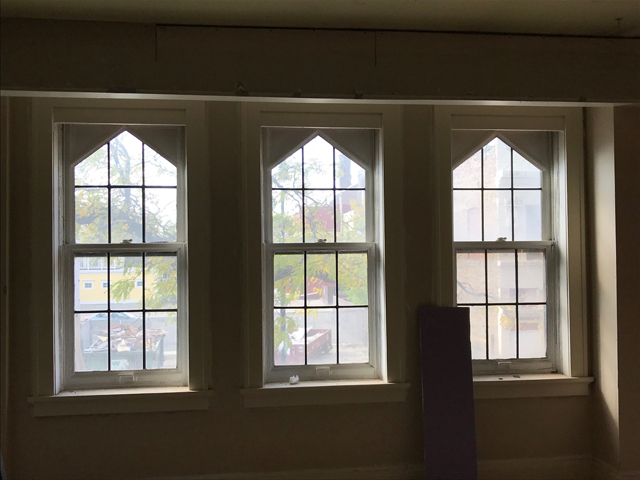 Window tracery consists of quoin-like stone patterns surrounding each window opening, from the third floor up." The perhaps immodest Schroeder was dreaming big at this point and his hotel – Retlaw, if you haven't guessed yet, is "Walter" spelled backward – feels oversized for its setting, but it was a hit, and soon enough the likes of Eleanor Roosevelt, Jack Dempsey and Gene Autry were bedding down in the hotel. A few years after it opened, Schroeder opened the Retlaw Theater – a performance house designed by Rapp & Rapp (who later drew Milwaukee's Warner Grand Theater) – on the next block. Parts of the theater survive and have been redeveloped for other uses. Photos of the interior show a luxury property with a stunning Crystal Ballroom on the second floor, above a large balconied lobby with a gorgeous bar. 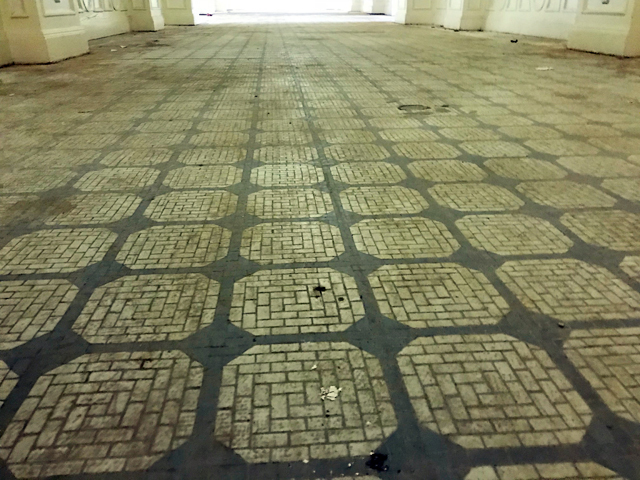 There are ornate plaster ceilings, and there was tilework throughout. 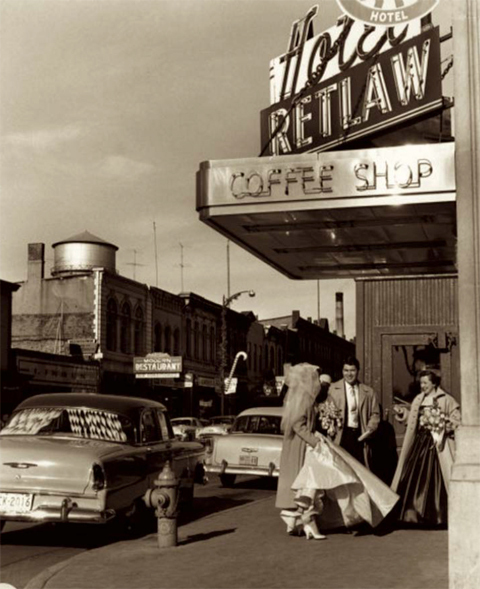 The Hotel Retlaw maintained its sleek image for decades, continuing to draw folks like President John F. and First Lady Jackie Kennedy in the early 1960s, and later, Tom Cruise, Alice Cooper, Paul Newman and the Oak Ridge Boys. 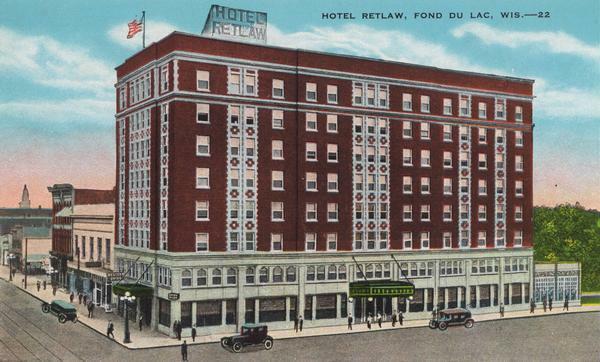 Even high-falutin' no-goodniks like John Dillinger, Al Capone and Joe Bonanno were rumored to have stayed at the Retlaw. 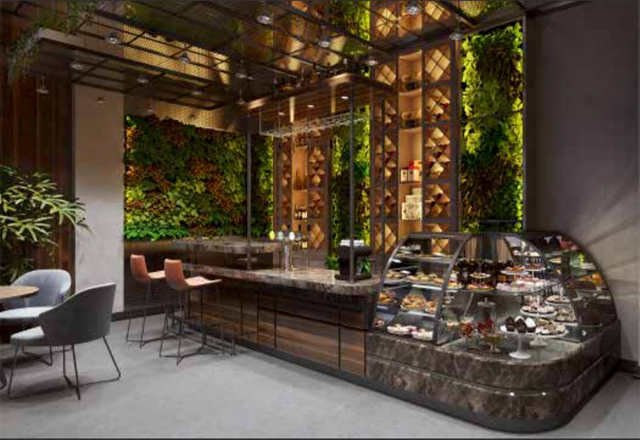 But while little on the exterior changed over the years, the interior underwent some transformations. The 265 guest rooms were pared down to 138 and will become 127 when the new iteration opens in a few months. The hotel was a Ramada Inn for a time, a Clarion, too. It was recently called The Retlaw Plaza. Some of the open lobby was closed off to create a separate bar at some point and though the impressive chandeliers continued to hang, the place just didn't glisten like it had in the past. And not always for a lack of investment. One of the owners spent $3 million to renovate it in the 1970s, but by the time Fond du Lac-based Legendary Hotels stepped in to buy the place in December 2015, the decor was not only dated, but worn. "More important than its Classical Revival details is the significance this building has as a type of building, a large, multi-story hotel building in a small city," notes that Architectural Inventory. "Hotels of this type are more frequently seen in larger communities. 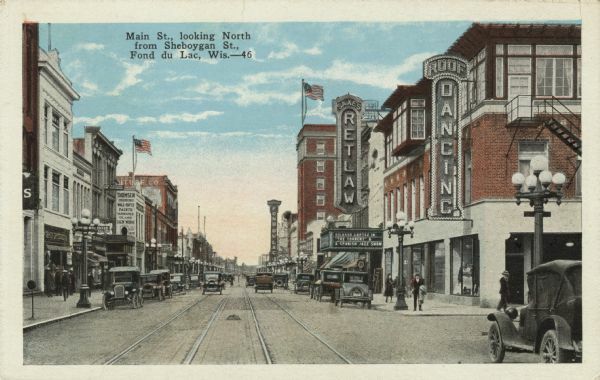 That such a hotel exists is significant, as this hotel ... has provided Fond du Lac with first-class hotel facilities in a large and first-class hotel building." The time had come to make that true again. 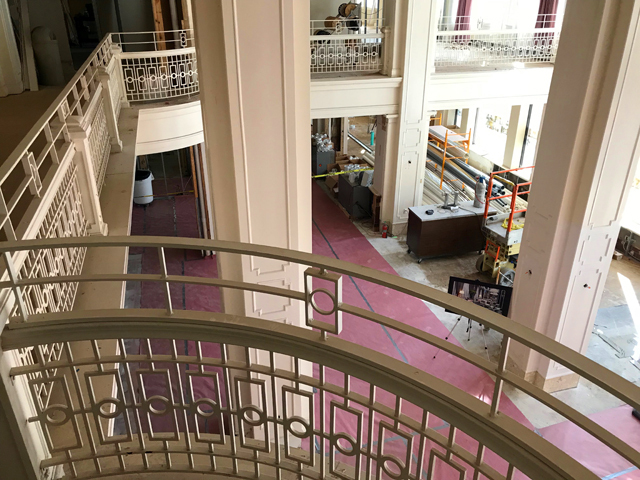 The hotel is undergoing intensive work at the moment, getting everything from new plumbing and electrical, to restoring the footprint of the lobby by tearing down walls added later. The transformation is so in-depth that it's impossible to list everything happening. But the new Hotel Retlaw will have a destination restaurant called Jazzmine's, an espresso cafe and wine bar, a full-service spa and hair salon, a refurbished pool, completely redecorated guest rooms and corridors, all new windows (except for some unique vintage windows on the second floor (pictured above), which will be restored), new furniture in the public spaces, a completely refurbished Crystal Ballroom that can accommodate 300 guests. They will also open a casual upscale sports pub, called The Player's Club Sports and Gaming Tavern, in the building next door. The project is expected to cost $25 million. 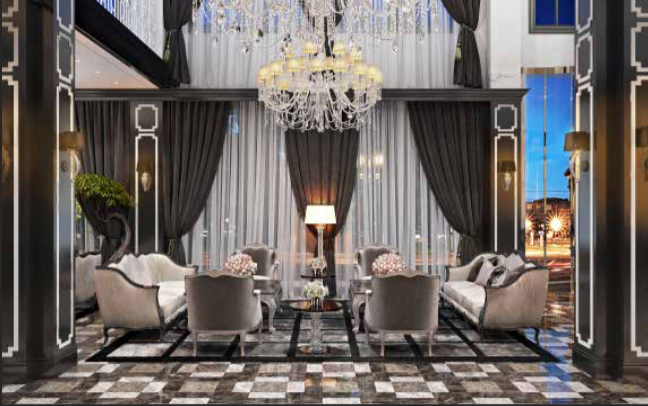 "The design of the hotel will reflect the grandeur of a bygone era while helping the hotel to retake its rightful place as one of Wisconsin's elite hotels and a preferred destination for dignitaries and celebrities," said Yvonne Roberts, principal of Guru of Luxury and creative director for Hotel Retlaw. 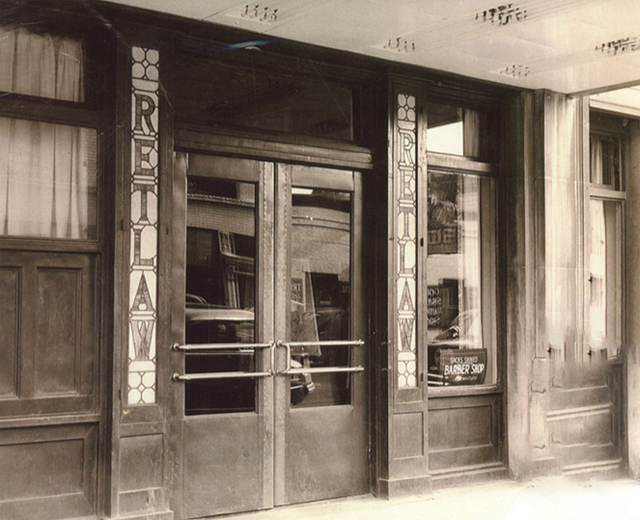 "Hotel Retlaw opened in 1923 during an era of incredible social, artistic, and cultural excitement. We are looking forward to bringing this iconic treasure in central Wisconsin back to life while infusing it with contemporary luxury." 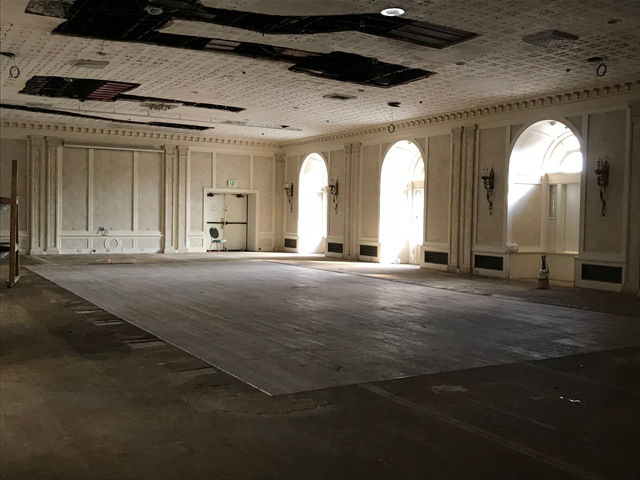 Leading the project are Legendary Hotels' Dennis Doucette and Steven Frantz, who first met during a stalled plan to resurrect another Schroeder hotel designed by the Tullgrens: the Northland in Green Bay. 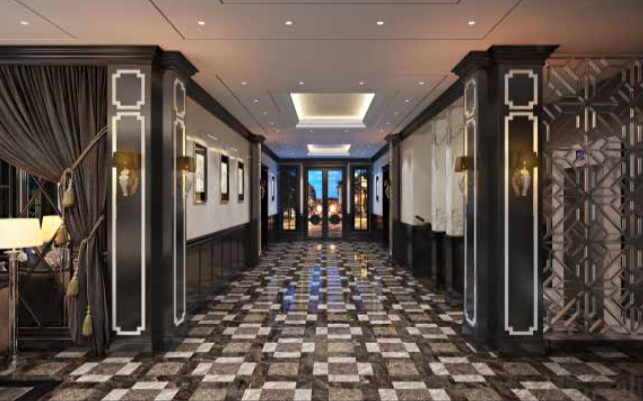 Doucette cut his teeth with Leading Hotels of the World and Seaway Hotels and has opened five hotels, including the re-opening of the Biltmore-Miami, where he collaborated with Roberts. Frantz's experience is on the sales side, which he earned over nearly 20 years with Benchmark Hospitality in Arizona. "We've spent the last two to two and a half years digging into the market formulating our business plan," says Frantz. "There is no luxury product in this market in the surrounding area, so we identified the need for this type of product in this market, and by talking to the established business owners large and small, our downtown business partners, as well as folks like Mercury Marine, Agnesian Healthcare, Fives Giddings and Lewis, Michael's corporation. "All of them have visiting customers and clients that come to town and they don't really have a product that's in this market that they feel comfortable putting those clients in. This solves that problem, as well as being a premier wedding destination. We're right in the center of Wisconsin. So we're an hour from Milwaukee, an hour from Green Bay, an hour from Madison. So, geographically we're in a great spot." 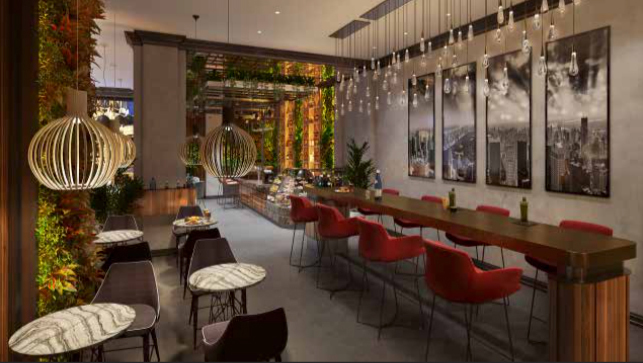 The architect of record for the project is Milwaukee's Kahler Slater, and Roberts has been tackling the modern, upscale design work, which, while it looks classy, it also feels warm and comfortable, says Doucette. "We're introducing a luxury product to a market that hasn't had one in 50 years," he says. "We don't want to intimidate people. We want people to feel comfortable here. We want the environment to be refined, but we want it to be welcoming and accessible. And at the same time we want there to be a bit of a whimsical approach to what the property is, to offset the perception of stuffiness in a luxury property." Room rates will, of course, vary by season, but start at $109 a night. Doucette says they estimate the the hotel will draw 35,000 travelers to downtown Fond du Lac each year and bring 150 jobs, too, creating an estimated annual economic impact of $25 million. "Hotel Retlaw will attract world-class travelers to Fond du Lac and will serve as a premiere destination for residents," says Doucette. "We've received extraordinary support from the community so far. Hotel Retlaw is poised to bring a vibrancy back to downtown Fond du Lac that many say it has lacked for years." 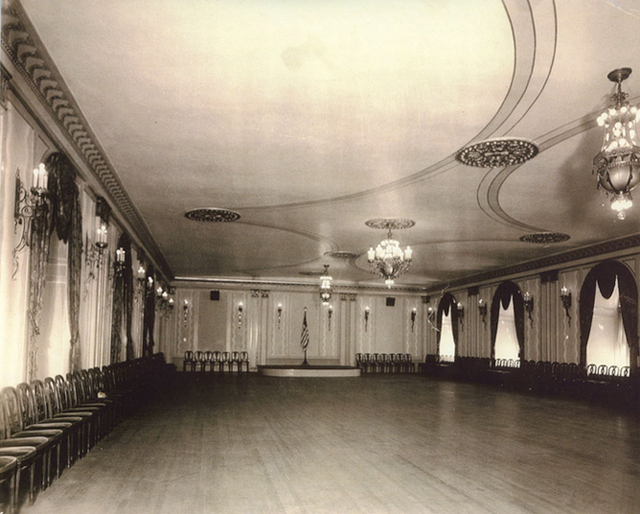 Renderings and vintage images are courtesy of Legendary Hotels.